"This post was sponsored by Walgreens Cystic Fibrosis Services as part of an Influencer Activation for Influence Central. I received compensation as a thank you for my post." Growing up, I remember always watching my grandma suffer. Suffer from things like having trouble breathing, always having a wheezing cough, constantly being constipated and depressed. As a little girl, I had no idea what was wrong. That was until my mom explained to me that my grandma was diagnosed with Cystic Fibrosis. At this time, I was old enough to understand a littler better. I was able to educate myself. And with Walgreens, I can Navigate the Journey Together. I no longer fear the diagnosis and neither does my grandma. I remember the day my mom told me my grandma was diagnosed with Cystic Fibrosis. I was devastated. That was without even knowing exactly what Cystic Fibrosis was. Well, Cystic Fibrosis is a really complicated, lifelong condition that affects approximately 30,000 adults and children in the US at any given moment. Cystic Fibrosis affects the digestive and respiratory systems. With treatment and adhering to a medication ritual daily, patients can live wonderful lives, while carrying this disorder. My grandma is on a strict daily medication regiment and with support from amazing programs like Walgreens Cystic Fibrosis CF Champions, she lives a healthy, normal life! She is actually happy and looks forward to my visits. It's companies and organization like Walgreens Cystic Fibrosis CF Champions that really help those with Cystic Fibrosis learn how to best handle their disease, offer medication and therapy advice, aid in the confusing nature of insurance, and offer patient assistance to make life wonderful again. CF Champions really does help my grandma's life become manageable and gives her control of the disease! If you or someone you know has CF, or is a caregiver for someone with CF, you know how frustrating it can be when the support you offer isn’t enough. Now, with CF Champions, you can become part of a much larger support system! A support system even my grandma understands and loves. 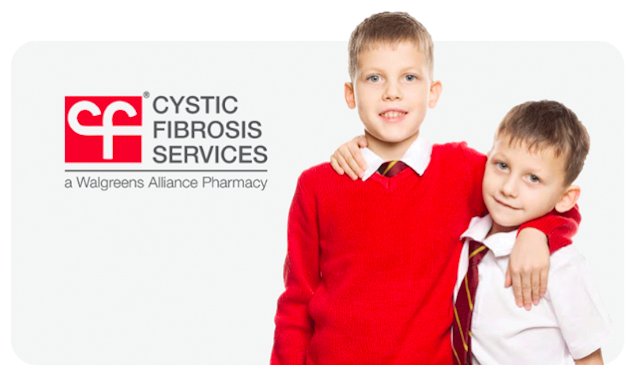 Become a CF Champion, and fall in love with the amazing resources that Walgreens has to offer. Always remember, keeping a healthy diet, ritually taking medication suited for you (and learning how to administer them), watching for signs of depression and maintaining a great support system can help you lead a normal, happy and healthy life like my grandma lives! Navigate the Journey Together, with Walgreens, and let them show you, like they showed me and my grandma that Cystic Fibrosis doesn't have to slow you down in life, because there are resources and support out there! I grew up with a friend who had CF. It's a tough disease and I love that Walgreens is doing this. Walgreens is doing an amazing job with this. It should be a hard disease. living with a debilitating life long illness is hard. Beyond hard. It's great that wallgreens are so supportive. It's a tough disease to handle and people who suffer from it need all the support that they can get. This is a great campaign, and it will empower those who are battling the illness! Oh, it is hard to have someone suffered from hard breathing. This is a nice service from Walgreens. It's good to know that there's a program that supports people with CF. It's tough to deal with it as it is and having people around who understand what they're going through is a nice break. Great information on Walgreen's program. I know that is a tough disease and the whole family needs all the support they can find. It's a devastating disease. I'm glad your grandma is doing better. I didn't know about Walgreen's program. I love that Walgreens is so supportive. Glad your grandma is doing better. CF is a crippling disease that I would love to see eradicated. I lost a good friend just after she turned 18 to CF and even now, after over 15 years I still can't get past what a great loss it was. I love that Walgreens is very supportive with this. I don't really know a whole lot about CF, so this helped me learn a bit more. It is so amazing that with diet and support people can live life the way they are supposed too! Yay Walgreens! I'm glad you found an effective support group. Everyone with chronic illness will benefit from support groups like Walgreens. brilliant initiative by walgreens and how they have decided to support this cause.